What are the best free things to do in Madrid for backpackers? While Western Europe can be a pricey place, you shouldn’t let that fact stop you from exploring major world nations such as Spain. One of the world’s biggest colonial powers in centuries past, this nation on the Iberian Peninsula has spread its culture and language across the globe, so if you’ve ever enjoyed a backpacking trip through places like Latin America, you owe it to yourself to explore its mother country back in the Old World. In Spain, many cities and regions await with a myriad of attractions – Barcelona and its cuisine, Costa Blanca and its beaches, and if the arts and culture interest you, exploring its capital Madrid is absolutely mandatory. If you’re going to save your money so that you can extend your time on the road to the maximum extent though, finding affordable accommodation in the center of Madrid is of paramount importance. There are plenty of options available there, which will inevitably save you even more cash that you would otherwise spend on transit or cab fare. Now that we have you saving money on the basics, here are 3 cheap or free things to do in Madrid that will help you get the most out of Spain’s capital without siphoning too much money from your bank account. At first glance, you might think you’ll either have to save up a ton of money to get into one of Madrid’s world class museums, or skip them altogether. However, two of Spain’s most famous art galleries (Museo del Prado and Museo Reina Sophia) have times during the week when admission is free. Museo del Prado costs nothing from 6 to 8pm from Tuesday to Sunday, and Museo Reina Sophia from 7 to 9pm Monday through Friday. While tapas are typically quite pricey, some bars in Madrid will serve them as a complimentary side when you buy alcoholic beverages. El Tigre, found on Calle Infantas is great place to do this, with Monday to Wednesday being the best time to visit if you want the best chance to get a table. Be sure to try the albondigas (meatballs)! One of the best ways to relax, see sights and save your money in any place you visit is to check out their greenspaces, and Madrid is no exception. El Parque del Buen Retiro is among the best recreation grounds that can be found in this city, as its centuries old trees, monuments to royalty and military leaders, and a monument to the devil (seriously!) will deliver tons of value without having to spend a single Euro. 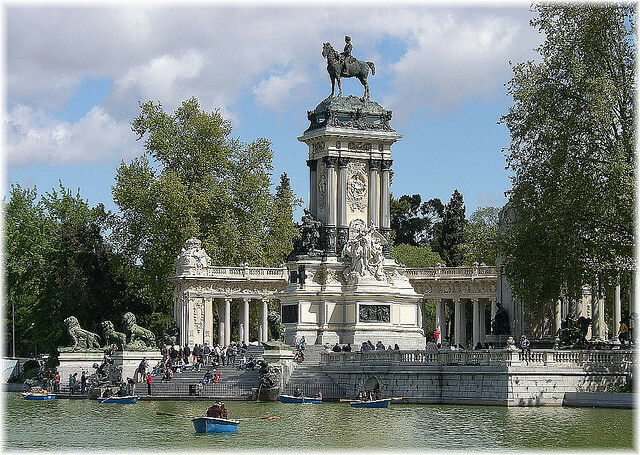 I have heard many amazing things about this park and I am yet to visit Madrid, so it’ll have to be added to my itinerary!